This ex-Shelby American Ford GT40, chassis #1018, is a special machine and one of very few GT40's competeting in historic racing today that is a truly original car. Its lack of race history in period left it in great shape for a contemporary racing career that has scooped a win and multiple podiums at Goodwood and similar such blue ribbon historic race events. I've been lucky enough to have contributed to one of those from behind the wheel, and in doing so recorded the fastest ever lap by a GT40 at Goodwood. This car is prepared to perfection by Dean Lanzante's equipe in the UK and it is thanks to their quality that it has become a great work horse for it's owner and I to dig deep into some advance driver training. This film features perhaps the sixth or seventh such day we've done in the past year and a half and, in that time, the car's owner has leapfrogged his way from the latter half of the grid into the top six on a regular basis. He even finds himself rubbing door handles with the pros occasionally too, often coming out on top. I take little credit for this because he has been the dream pupil: making sure never to let too much time pass between outings, always arriving well rested and focused, and never afraid to invest in all the right tools for the job. It's certainly made my job an awful lot easier and we've had great fun in the process. I hope this film gives you a little snapshot into how a typical coaching day looks, and some sense of the extraordinary driving experience that is hustling a fifty year old GT40 around a race track. Enjoy and please comment and like (if so inclined)! The Aston Martin DBR9 GT1 racer is a car I lusted after driving throughout my sportscar racing career, but never quite managed. Don't feel too sorry for me though, I drove for the factory team in LMP1 (the gorgeous Gulf-liveried, Lola derived prototype) and for Jota Sport in a GTE spec V8 Vantage, so I understand if the violin remains a string short. It's just that the DBR9 always seemed that little bit more special - a little more pure in it's lineage, and a little more breathtaking in its design. That something so beautiful could roll up at Sebring in 2005 and win one of the toughest endurance races on the calendar straight out of the box says everything about the calibre of this machine. Based on the Aston Martin DB9 road car, the DBR9 retains the chassis, engine block, and cylinder heads of the road car's six litre, normally aspirated, V12 engine. The rest of the car is re-engineered for high performance competition use. The DBR9's bodywork is a blend of optimum aerodynamic performance and the styling of the DB9 road car. All the body panels are constructed from carbon fibre composite (except the roof) to minimize the weight of the car. To complete the aerodynamic body, the bottom of the car is flat all the way from the front to the rear diffuser. To optimise rear downforce a carbon fibre wing has been added. The car officially goes from 0-60 mph 3.4 seconds, but that depends on a myriad of factors. Here courtesy of the Global Endurance Legends organisation which is building a grid of iconic racers from the 1990's and early 'noughties into a racing series, I was grateful to receive a dream invite to test the car from owner, Gregor Fisken. With 600bhp under my right foot I was sure to be entertained, but like all of the best endurance racers, it felt eminently manageable, as though the car was quite happy to to the bulk of the work, only requiring the occasional hint from me as to where I'd like it to head. Inputs were met with an instant and proportional response, such that I felt right at home within a lap or two. Only over bumps did I find the handling a bit nervous, the suspension just a little too stiff for the circuit and cold conditions. Really the only negative was that the brakes were slightly underwhelming, but I put that down to aging ceramics and a brutally heavy 'lump' upfront. So here it is, as promised, my review for Heritage Aston Martin dealers, Nicholas Mee & Co, of the brutal Aston Martin V8 Vantage 'Le Mans'. Appropriately timed as we look forward to this weekend's 24 Heures du Mans, I only wish they'd have let me keep it for the journey down. We had one helluva time shooting this car, I thoroughly enjoyed it - and frankly was blown away by its versatility. You can read my full review in their excellent magazine, Full Bore (download it here), but first - turn your speakers up, and enjoy the full film review below. In Articles, You Tube Channel, track tests, Video, onboard Tags Aston Martin, V8 Vantage Le Mans, Sam Hancock, Nicholas Mee & Co.
Having just submitted my write up of the limited-edition 1999 Aston Martin V8 Vantage 'Le Mans', I am nervously awaiting the final edit of the film we shot while testing the car. 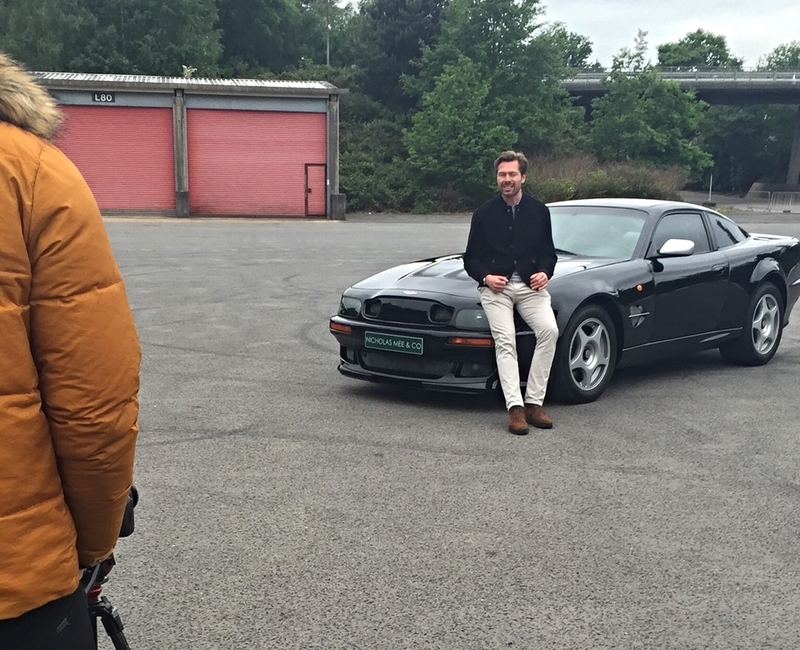 Invited by noted Aston Martin heritage dealers, Nicholas Mee & Co, to try the car at Longcross Proving Ground last week, it was the first time I've not only conducted the track test, but written the script and presented my story to camera. It's an astonishing car with a lovely history. Built to commemorate the 40th anniversary of 1959 Aston Martin's Le Mans win, just 40 were made, each with frankly absurd amounts of power. Sometimes I have to pinch myself. Yesterday was one of those days, arriving at Pembrey in Wales to find not one, but two, insanely exciting cars, neither of which I'd driven in the past. The first, a Porsche 935 Turbo - aka "Whale Tale" - that so inspired sportscar racing fans of the seventies with it's sheer absurdity. Barely recognisable from the humble 911 that forms its base, the 935 is absurdly wide, absurdly powerful (the team reckoned 700+bhp, they weren't sure! ), and absurdly AWESOME. There to help coach the owner and provide some thoughts on set-up, I wondered how such monster could ever be tamed on the relatively little Pembrey circuit in Wales. Watch the video to find out how it went. I wish I'd had a mic in the helmet because I was honestly giggling like a school girl most of the time - it must be the only car ever to have made me literally laugh out loud while accelerating!